That's right, suckas. We're going to Italy!! This November, Jesse and I are taking a trip to Florence and Venice. I can't think of anything cooler, really. I’m pretty sure that “suckas” is Italian for “All ye who are less fortunate than I.” Or something. We’re not getting any rental cars. We’re doing this on the cheap. So we’ll be hoofing it or bussing it or something similarly cheapskate-y. I can’t believe I’ll actually be going somewhere that you have never been. I really didn’t think that was possible. I am SO JEALOUS! If you randomly see a missionary named “Anziano Mayberry” hug him. Don’t even tell him you know me, just hug him and scare the crap out of him. Then buy him a Gelato or something. I’ll totally pay you back. I believe in Italy you’re supposed to ride an old 1 speed bike. And when I say “you” I mean you and Jesse are supposed to share the one bike. At least that’s what “Life is Beautiful” taught me. Florence is amazing. The city is foot friendly and its really pretty small-and most of the places you’ll be aren’t real far from each other. As far as the trains go–they are easy to use. We took the train to Pisa and then I took off and went to another town in Tuscany(I’d have to look it up) and went by myself. Easy to get around. Gorgeous, gorgeous place. Definitely somewhere I want to get back too. I can give you the names of the best gelato places and a little restaurant we found that was spectacular if you want. I liked Venice, but I fell in love with Florence. Oh, and try to learn a little italian. It helps. That is awesome. My sister and niece just came back from Rome this past week. Congrats guys, that should be a fun trip. Italy is a beautiful country. Make sure to eat at one of those small restaurants hid away in a corner. I had lasagna at such a restaurant when I was in Bologna, and oh man, that was the best tasting lasagna I’ve ever had! I’m sure you guys will have so much fun. Take lots of pictures! Can you find out if they call Italian seasoning “just seasoning” for me? 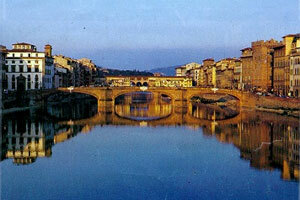 Florence is wonderful. Venice is interesting too, but not somewhere I’d spend much time again. You’re going to have a lovely time. Next story And yet, I can't look away.